From whom are we guarding the West Gate? I continue to read many brothers who seek to restrict membership to the point of idiocy. They attack Shriners for being to big and they find One-Day Masons to be fake. 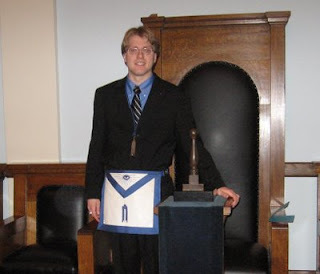 If a brother does not attend every meeting, they believe the brother is somehow destroying Freemasonry. Now, I realize that most brothers who participate on message boards and write blogs are like myself, extremely passionate about Masonry. It appears to me that if we are to guard the West Gate, then we must guard it from both sides, those men who really are problematic if they join the Lodge and those brothers that seek to prevent good men from entering into the Lodge. We already have ways to prevent men of questionable qualifications from entering our doors; it's called an investigation. These passionate brothers seek to close the door, leaving only a crack. They really are not seeking good men but men that are mirror images of themselves. But take a look in the mirror, are you the best man in Freemasonry? If you answered yes, I have some bad news for you, you're not . This excuse has been used for many evil purposes such as keeping good minority candidates from entering the Lodge. Yet it continues to pop up in people's arguments. It is a cliché, people. Obviously, I do not seek to end the investigation of candidates but I suggest to those brothers on the other side of the door that they might look at themselves first before casting judgment on worthy candidates. Remember where you came from, stop and think. Unfortunately, I must end this article with another Masonic cliché. Our Fraternity seeks "to make good men better." We are not asking for Adonis only to enter the door but all good men who seek to be improved. Yet, we still hear brothers, on every blog and message board, use the excuse that we must "Guard the West Gate." They forget that we all enter into the Lodge as rough ashlars seeking to be improved. Masonry is about self-improvement and societal improvement and we, as a society, do a great job finding good men to improve. One of the most gripping attorney shows on TV is Harvey Birdman, Attorney at Law. Just kidding! One of my favorite lines (especially fitting for a law student) is: "Debbie, we're going to need some law books. With pictures this time." Enjoy! Oops, sorry I didn't explain the clip better. "Harvey Birdman" is a cartoon on Cartoon Network that takes the characters from the Hanna-Barbara show "Birdman and the Galaxy Trio" and changes them into lawyers. Harvey Birdman defends different cartoon characters of the Hanna-Barbara universe. This clip comes from the episode, "Birdgirl of Guantanomole" in which Birdgirl and Birdman have to defend Morocco Mole who has been imprisoned in Guantanamo Bay, Cuba. My wife and I will be working the Kids ID booth this weekend at the Minnesota State Fair. I have worked a Kids ID booth before at the local celebratory days in Farmington but I have never worked "the Fair". For those unfamiliar with the Minnesota State Fair, it is the biggest celebration in the state; it ranks second in attendance after Texas. I, for one, am excited to eat my usual favorites: cheese curds and a rib sandwich. Here is a fun fact about the MN State Fair: On Sept. 2, 1901, Brother Teddy Roosevelt gave his famous "Speak Softly and Carry a Big Stick" Speech at the MN State Fair. Days later, he became president after President and (Brother) William McKinley was assassinated. There was a dangerous chemical being sold in towns throughout the United States. Its name: Silly String. Steve Carrell gave his report in 1999 of what was a hazardous trend affecting Shriners and children alike. (Ragan) plans to pursue membership with the Shriners fraternity. I really think what the Shriners' goals are laudable. I know that there has been the New York Times article concerning some improper dealings in the Shrine and I really think that it has been adequately discussed at length at both the Freemasons for Dummies and the Burning Taper blogs. I would rather go another way, to describe what Shrine does to help people, specifically children. To explain where I am coming from, I am not a Shriner and do not plan on petition anytime soon. However, I really think what they do at the hospitals is very commendable. Shriners Hospitals for Children is a one-of-a-kind international health care system of 22 hospitals dedicated to improving the lives of children by providing specialty pediatric care, innovative research and outstanding teaching programs. Children up to the age of 18 with orthopaedic conditions, burns, spinal cord injuries and cleft lip and palate are eligible for admission and receive all care in a family-centered environment at no charge – regardless of financial need. Unfortunately, in the hemisphere of Masonic Information on the Internet, Shriners seem to be attacked at many turns. Whether it be because they are too large, lack of oversight or the current bookkeeping problems, the message of the Shrine is being lost. Shrine was and is the reason why many become Masons. Some might have had a kid in the hospital or were in the hospital themselves. Remember, just because someone is a Shriner does not mean that they are in charge. Many Shriners just go about their business having fun and helping kids. With this endorsement, many more brothers may join the Lodge which is just fine by me as we still share the desire to help people. Ray Stevens originally produced "The Shriners' Convention" in 1999 1979. According to Wikipedia, Stevens wrote the song after being in a motel during a Shriners' convention. The song involves the belief that although Shriners are to act as upright "pillars of the community", the wild times that Shriners appear to enjoy is completely opposite that concept. In the song, the Potentate named Bubba is on the phone with Coy, the life of the party, who continually admonishes Coy's behavior at the convention. The song is an obvious lampoon of the Shriners' love of fun. The major reason for the Shrine's existence is to balance the solemnity that occurs in a Lodge with the convival nature of a Fraternity. During the 1870's, many Lodges became dry and the temperance movement began to become a major factor in American life. Many Lodges became obsessed with ritual to the loss of brotherhood. Shriners represented the joie de vivre that some Masons felt the Fraternity was lacking. Today, the spirit of fun still exists in the Shrine with Shrine Circuses, Shrine Parades and other activities still being held to this day. Shrine Conventions can have as many as 20,000 conventioneers showing up to the host city which boosts the local economy. Shriners are also, most importantly, the administrators of 22 hospitals for children free of charge. The Shriners have fun for a reason and this song shows their bonhomie. Even in the mocking nature of the song, the Shrine still is represented as having a sense of humor. Hey, at least they aren't the Hell's Angels. If you would like to see the lyrics, please visit the Grand Lodge of British Columbia and Yukon's website. Stevens, Ray. "Shriners’ Convention. "Greatest Hits [MCA] 1999. Video used for Illustration Purposes Only.